Constantina Gregoriou is a clinical psychologist of “Hope for Children CRC Policy Center” as a Psychologist at “Home for Hope” at the Foster Care Department. She previously worked at the private shelters for unaccompanied children of Hope For Children providing psychological support and guidance to the children and participated in several experiential workshops. She has a psychology degree from University of Liverpool and a master’s degree in Clinical and Health Psychology from Newcastle University. She has also graduated from European University of Cyprus with a Masters’ degree in Clinical Psychology. 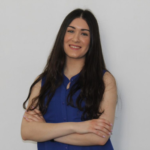 Constantina has experience on research and especially on clinical psychology topics such as eating disorders, hallucinations and depression. She has also worked with autistic children and adult people with mental disorders.